Good times for those  still trying to explain the irrelevance within Chinese society of all the people detained, arrested or disappeared  since late February. 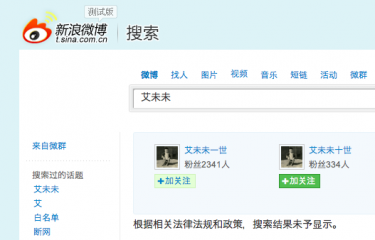 Chinese Internet services continue to block essentially any mention of these names, and Ai Weiwei ‘s situation remains unreported  by Mainland Chinese media. 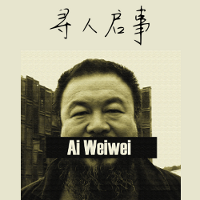 Many Twitter users are calling for Ai Weiwei to be released, and a petition is underway here , and a website to learn more about Ai Weiwei has been set up here . Yesterday marked 36 hours since he was detained, but still there is no new information. Wuyue Sanren : Relying on fear and disappearances to eliminate dissent and rule the country means, number one, that this is no golden age. A golden age does not take place among daggers and police batons; number two, it won't last long, there are many lessons we've learned which are testament to this much, and this still has yet to be proven again. Zhai Minglei : As a scholar who researches civil society, Ai Weiwei is one of the more outstanding citizens that I've ever seen, from his investigation  into the list of names of earthquake casualties to his work  on the Yang Jia case, fighting the beautiful fight, the kind of person who shouldn't now be locked up, but instead ought to be up on the chairman pulpit in place of those who only pretend to have any sort of moral authority. Of course, if Old Ai were to go sit in the chairman seat, he'd just flip everybody the middle finger. Pu Zhiqiang : In the Yang Jia  case, he called for justice. In the manmade disaster following the Sichuan earthquake , he launched an investigation. When Old Tan got put away, he went  to bear witness and instead got attacked; when his assistant Liu Yanping  was being held , he immediately turned around and went back to save her; when artists faced having their studios demolished, he went straight to Chang'an Avenue ; in the wake of the Jiaozhou fire , he went to seek out the truth; after Qian Yunhui ‘s tragic death, he spoke directly with the media. The world's not much difference only because of him, but without him, it becomes much, much different. He'll get out sooner or later, but I still want to see that chubby face of his again, which is why I can't stay silent. Of the experiences created by Ai Weiwei, one example is his attitude toward conflict. In the past, when we encountered conflicts, we felt we could only film them covertly, because we have no power in conflicts with police. But Ai Weiwei and his group, they showed us their experience  of engaging police in direct conflict, and how to use technology to gain the upper hand. Because of this, Ai has managed to greatly legitimize the act of citizen filming, showing people that they have the right to film and record, as well as the right to scrutinize. He emerged to show public authorities just what kind of status those doing filming should have. In the past, emphasis wasn't placed on establishing such a status, because we all felt that people filming events were in a position of weakness, to be crushed at any time , and so we avoided it. When Ai Weiwei gave credence to this view, it was a giant breakthrough for him. A breakthrough not only in regard to the content of his films, but also quite important was that someone with a camera had stood up. In other words, he showed us that anyone with a camera doesn't have to run off, and this stance, that people with cameras can stand up, was hugely illuminating. Stand up, don't back off, keep on filming, filming each other. This was a breakthrough. China won't see a return of the red terror of arbitrary home ransacking and pervasive literary persecution, however incidents of home searches and confiscating computers  are now quite common. Someone said, if you open your mouth again, the next one to disappear will be you! To that, I might quote one saying from Ai Weiwei making its way around Twitter: “I'm very afraid, I'm not fearless. I might even be more scared than others. The reason I'm brave, though, is because I know what the danger is, and that if I don't take action, that danger will only grow stronger.” Please note that I said “might”, the implication being: do you really believe that he's afraid? If you look at the “Chinese Man” piece in Sensitive Parts  [an art exhibition held in Beijing last month which saw four artists arrested ], who wouldn't want to whip off their pants  and give it a go, streaking toward freedom. Today we don't see Ai Weiwei on Twitter; Today, everyone can become Ai Weiwei. If you like him, then live like him, and love like him. Love your friends, the children, every cat and dog. Love the people under torment, and speak for them. Countless numbers of you will become Ai Weiwei. China doesn't need to be a barren desert full of crabs . As descendants of the grass mud horse, you can see and be proud, knowing that your offspring will evolve into humans—into happy Chinese people. “Missing persons: Ai Weiwei”, a stickeraction from Chinese Wikipedian Shizhao's blog .